Travel-Pal is designed to keep books and toys neat and organized. It has a deep cargo bin for toys and lots of pockets for smaller things, too. It also has insulated drink holders and the entire cargo area is waterproof – just in case. Travel-Pal fits between two child car seats and it’s big enough to hold everything for both children. 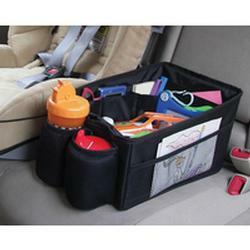 Travel-Pal is the best way to keep your backseat tidy, toys within reach and everyone happy.